SVL’ s team spent two days up north at Arrowwood Resort for the 43rd Annual MHCEA Conference (Minnesota Healthcare Engineers Association). This event provided a forum to update and improve technical and management skills. This conference also focused on understanding the latest code requirements and technology advancements. 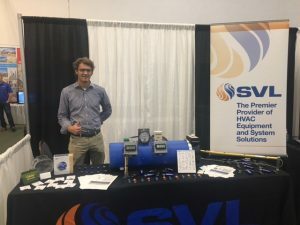 SVL participated in the vendor show and enjoyed meeting manufacturer reps, learning about new products and services and catching up with customers. SVL’s booth featured two different product displays, highlighting both VRV and heat transfer systems. SVL also gave away a Nest thermostat and Cabela’s gift card to two lucky winners. Located on the picturesque Lake Darling in Alexandria, MN this was a great setting for industry networking. The conference educated on issues affecting all healthcare facilities including regulatory compliance, maintenance and safety. Whether you’re new to healthcare or experienced, this event provides opportunities to discover the multitude of challenges that confront us every day. SVL is looking forward to attending again next year! To learn more about SVL, click here. SVL Takes On the SMARCA Golf Challenge SVL Celebrates 50 Years in the HVAC Industry!